I'm Alec Delage, and I've been in charge of the Pourvoirie du Lac Saint-Pierre outfitting operation for the past ten years. The Pourvoirie du Lac Saint-Pierre has been around for about 20 years. I've been in charge of its operations and development for about ten years. The Pourvoirie du Lac Saint-Pierre is located in Saint-Ignace-de-Loyola, on the north side of the St. Lawrence, among the northern islands of the Lake Saint-Pierre archipelago. It offers many activities, as well as accommodations in the islands of Lake Saint-Pierre. We have eight cabins on the islands, which are very convenient for clients who come here from near Saint-Ignace, or elsewhere—from Montreal, the North Shore, and all over Quebec. Staying on the islands of Lake Saint-Pierre is a unique and fascinating experience. We also offer day-long guided fishing trips. One thing we offer that is very characteristic, and represents our mission very well, is the Académie de pêche du Lac Saint-Pierre, a summer fishing camp which I founded with my team about five years ago. We are open from May to October. At the beginning of May, we do a lot of fishing. If you look at our guided fishing service, the guided fishing trips we offer are focused on education. We take people out to catch fish, but we also teach them about fishing methods and about the species you can find here: Yellow Walleye, Black Walleye, Largemouth Bass, Smallmouth Bass, Northern Pike, Carp. It's a good introduction to the territory. We also have a lot of fish for people to catch and we're known for our skill in showing people how to catch various species. So, starting in May, we take people out for an all-inclusive trip. People just come here with their lunches and head out for the day with a guide, on one of our safe and comfortable boats, and we include everything. When they get back, if they've kept any fish, the guide will help prepare them and show them how it's done, talk about fish anatomy, and then the clients leave with their fish. We also rent out boats in the spring. Some people come down to the Pourvoirie with their own boats to go fishing. We also have the Académie de pêche du Lac Saint-Pierre, which is unique in Quebec. It's the only youth fishing camp in the province. Five years ago, we decided to offer this activity because we saw that young people didn't have any opportunities to access fishing territories or natural environments, and Lake Saint-Pierre is a great educational environment. It's a wonderful ecosystem with incredible biodiversity. That's why we decided to start a week-long camp. We welcome 12 kids between 9 and 15 years old each week, for seven weeks. So from the end of the school year until one week before school starts again in the fall, we welcome kids 9 to 12 years old or 13 to 15 years old, from Sunday to Friday. 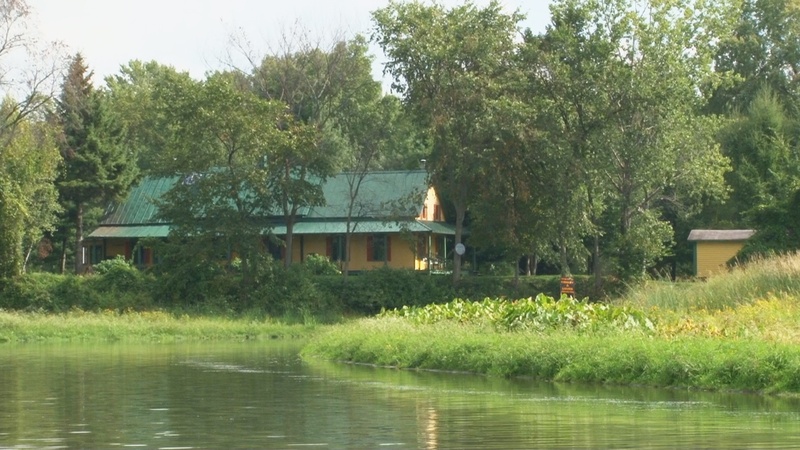 The camp is 100% focused on fishing, outdoor activities and education. We talk about the environment. The kids go fishing for walleye, pike, bass and carp. We haul in nets with commercial fishermen. We visit outfitting operations in Lanaudière, a little bit north of here, where they do trout fishing. They learn how to fillet a fish. We discuss biology, ecology, ornithology. It's an intensive week of fishing and it gives us an opportunity to teach them about modern fishing methods, which are focused on an individual species. We also teach them about conservation, and tell them how and why we fish for certain species here on Lake Saint-Pierre. In Quebec, many people fish for trout, and trout season closes in early September. The species we have here, in Lake Saint-Pierre, are walleye, pike and bass. These fish feed in the fall to fatten themselves up for the winter so they can breed successfully in spring. So in the fall we get a lot of people coming to fish here. This year, we also started to offer hunting. We started hunting deer, here on the islands of Lake Saint-Pierre, and our hunt also focuses on education. This is a new activity we are offering this year at the Pourvoirie; we do focus on taking deer, but our methods are based on sustainable development and population management principles that we worked on for three or four years. So this year, we can offer people the opportunity to participate in population management by taking a deer, and also do some fishing. We offer a hunting and fishing package in the fall. I'm a hunter and a fisherman, and I've fished all over Quebec. The main advantage of Lake Saint-Pierre is that it's so close to the big cities. It's 45 minutes from Montreal, 35 minutes from Trois-Rivières. So I think people who travel all over to fish, along highways and gravel roads, should be aware of Lake Saint-Pierre, an expanse of water on the St. Lawrence, which is easily accessible and teeming with fish. I was trained as a wildlife technician, and I can tell you that when it comes to species biology, your chances of landing a good-sized fish are much better here, in Lake Saint-Pierre and the St. Lawrence, than anywhere else. Why? Because we are in the south. Bodies of water in southern Quebec are richer. All the large bays that border Lake Saint-Pierre, among the islands, are teeming with bait-fish and other food. So the fish grow very quickly. That's why, despite the high fishing pressure, there are extremely good fishing opportunities here. And the landscape is beautiful.